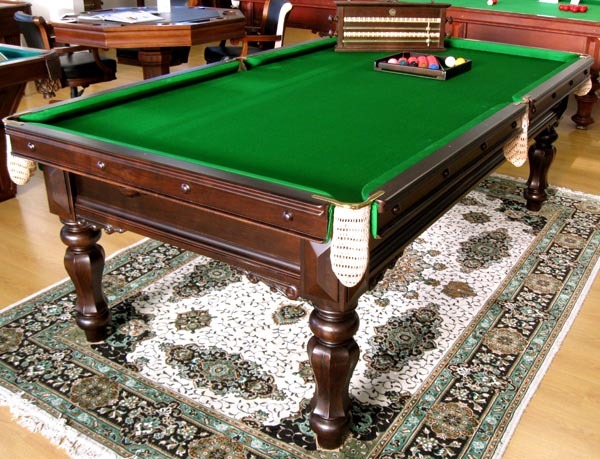 Barton McGill Billiards is a long established Billiards, Snooker & Pool table specialist which provides a comprehensive selection of Antique slate Billiard Tables, New Custom Handmade Tables, Games-room Furniture and Accessories. It is the mission of our company to offer customers items produced and finished to the highest standard combined with an outstanding service. We believe that great service is essential in today’s competitive and often confusing marketplace. Our company offers these services to Businesses, Architects, Hotels, Interior Designers and direct to Private Customers here in New Zealand and throughout the world. 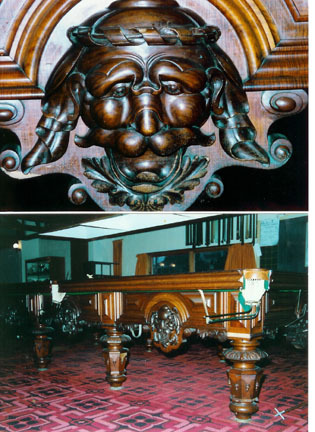 Barton McGill stocks Antique Tables dating from 1880 to 1930. These tables were made of the finest timbers eg: Cuban mahogany, Tasmanian Blackwood, Oak, Queensland Maple and Walnut burr veneers with decorative inlays. The tables are restored with great care and attention to detail for which Barton McGill is famous world over. 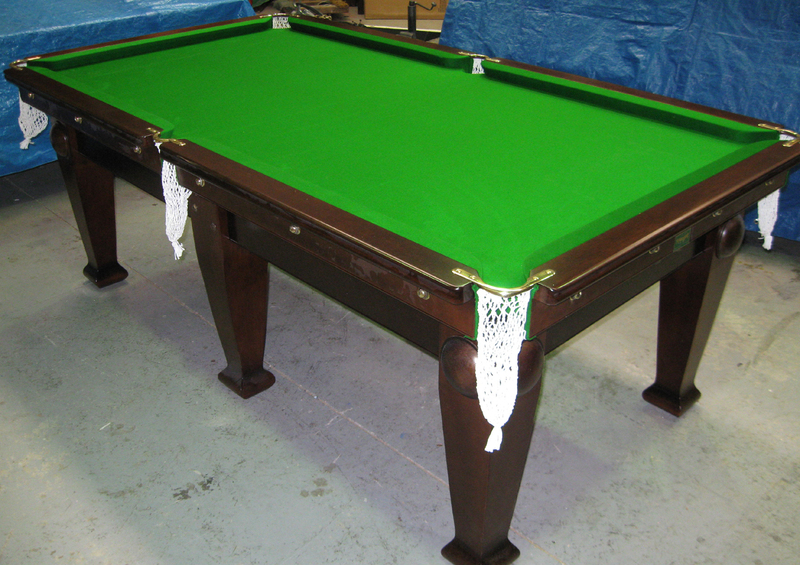 Our company has been manufacturing bespoke billiards, snooker, pool tables and convertible dual-height diners for over 120 years,and as our website illustrates, there is a vast range of models available, from good quality functional tables to very decorative and ornate designed tables. 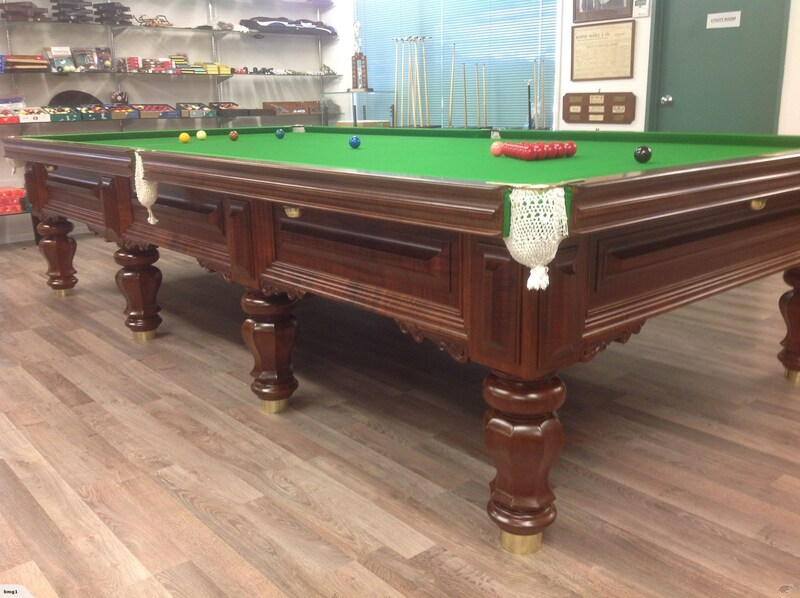 We have a large showroom displaying around ten fully assembled Billiards, Pool and Games Tables of all sizes, including a selection of Convertible Billiard/Dining Tables. Customers can also view our large selection of Antique Accessories, New Accessories, Chairs, Billiard Lighting and Games room furniture. 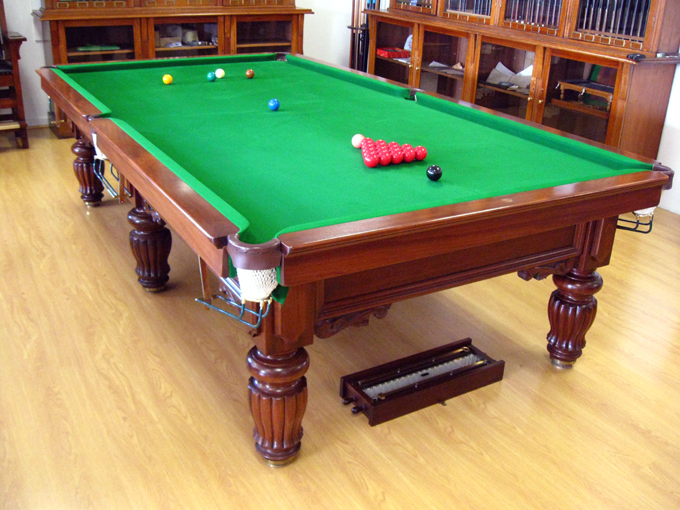 We offer NZ’s largest selection of billiards tables, games room furniture and accessoriesFor additional information and/or if you wish to visit our premises please do not hesitate to contact the showroom. You will only ever have one chance of owning this beautiful rare billiards table in your lifetime. Timing is everything and if this is the right time, then this definitely is the table for you. “Duke of Edinburgh” model full-size billiard table, hand-crafted by Alcock & Co. Melbourne, Australia, and manufactured during the 1870s. This beautifully restored and rare table, features vivid ‘fiddleback’ Tasmanian Blackwood show timbers, eight heavy canted legs in blackwood, scalloped fascias on the framework with matching knee panels and cushion panels, and carved leg brackets. The slate bed is Bangor slate from the famous Penrhyn quarries in Wales, being a massive 1.1/2’’ thick and hand floated to the finest tolerances to ensure a perfect roll. 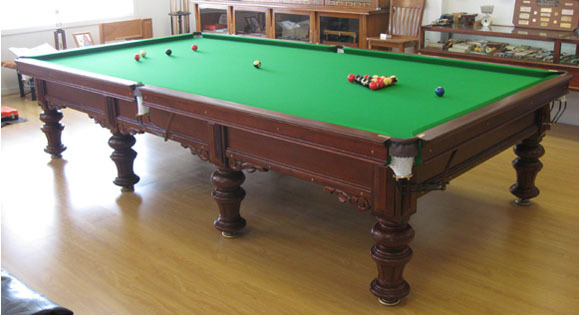 In 1867, Alcock’s were commissioned by the Government of Victoria to prepare a full-size billiards table as a gift, since he was fond of billiards. The prototype model of this table was presented to the then Duke of Edinburgh (Alfred, second son of Queen Victoria) during his visit to the Colonies of Australasia 1867-1868. This distinctive table became the prototype of the famous “Duke of Edinburgh” model table, some of which today still remains the prized possession of a fortunate few billiards enthusiasts. The table comes with a comprehensive set of associated equipment (see list) including a very fine marking board and a wall-fitting pillar style cue rack, ball tray and original wooden matching marking ’D’ (pic in situ of a similar model). We offer a Worldwide delivery and installation service by our factory trained master fitter. Expertly restored by “Barton McGill Billiard Tables”. Viewing is at our Wairau Road, North Shore, Auckland showroom. 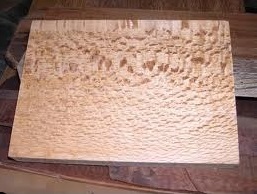 This table is a beautiful example of the maker’s art.. This magnificent table, an example of the exacting craftsmanship of the billiard table makers of yesteryear, Hand crafted by Alcock & Co, from solid New Zealand Rewa Rewa otherwise known as Honey Suckle. 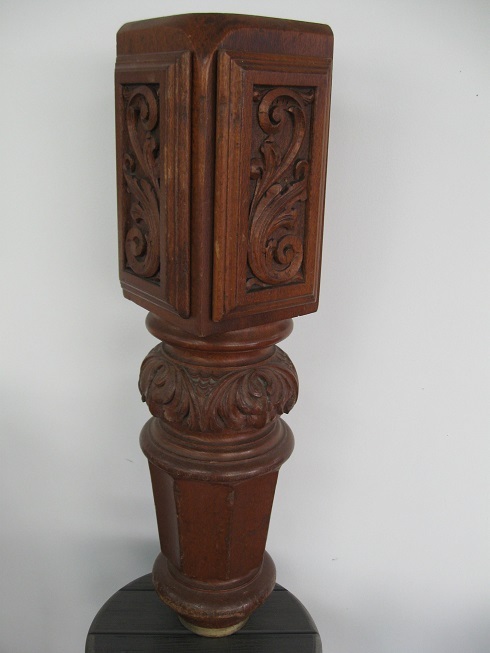 This timber is very attractively grained and was prized for inlay and ornamental work by the early NZ furniture makers. Finding the quantities & sizes required to make this table is extremely rare and it is the only billiards table we know of to be made in this beautiful native NZ timber. Featuring Welsh five piece one & half inches thick slates with the cushions bolted directly into the slates for speed and true rebound. Individually hand carved Leg Panels adorn the table knees and compliment the ten inch diameter hand carved legs. All woodwork has been stripped back to bare wood and re-polished in Mirrortone lacquer to a warm honey finish or to a your own choice of finish. New Rail pockets, nets & leathers fitted. 1 x Reconditioned Scoreboard in matching color. 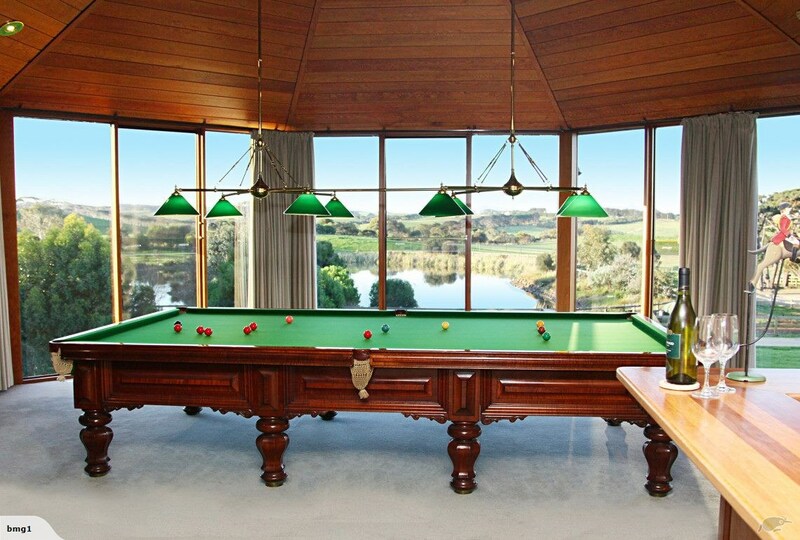 “Victorian” Barton McGill 10ft Billiards table Circa 1987. This table is in exceptional condition, just like new! Barton McGill Victorian billiards tables are handmade and are all individually pre-assembled, slates hand-floated cushions fitted, and all parts serial numbered and stamped before final polishing & delivery, ensuring a perfect table every time.These time consuming & costly manufacturing processes are un heard of today in this era of mass production. 8ft Alcock & Co Billiards table. Circa 1870’s. Antique “George Wright” of London Full-size Billiards table,circa 1895. This beautiful table is hand crafted from Cuban Mahogany with massive 1.1/2″ thick Welsh slates in 5x sections. The legs are hand turned with vertical fluting and solid brass adjustable levelling toes (very rare in this era table) Hand carved leg scrolls add to the symmetry and balance of the table . The table is over 115 years old and it presents and plays like new. This table has been completely re-furbished by the famous NZ makers, Barton McGill Ltd of Auckland: and includes refurbished antique scoreboard and all new playing accessories for both billiards and snooker. This quality & craftsmanship has to be seen to be believed. Including a full range of new and antique accessorie You will not find a better example of a antique full size billiards table and can be viewed at the Barton McGill showroom. Billiards Ltd “Viceroy” Full-size Billiards table. Circa 1970’s. This table has hand -floated 1.3/4 inch thick Slates. The westmonister bridge frame is made in solid Mahogany and has been completely stripped back to bare wood and re laquered & colour matched to a warm expresso color. The cushions have been fitted with new patent Barton McGill Full-size rubber cushions, with pockets cut to IBSF Templates. Bed and cushions covered in Strachans 6811 World Championship Superfine cloth. New Rail pockets with white cotton nets fitted to solid brass pocket irons and covered in NZ leather. Made by Alcock and Co in Melbourne, circa 1907. This beautifully hand crafted billiards table converts to a dining table and was made in a time when quality was not a compromize and when the makers were were highly skilled “artisians”. Comes with a Accessories Pack which includes Pool Balls, Snooker Balls. 4 Maple Snooker cues, 2 Chalk Holders, Dust Cover, Cross rest, Spider, Cue rack, Triangle, Scoreboard, Oak ball tray, Fulcrum Jack, Chalk and Table brush. 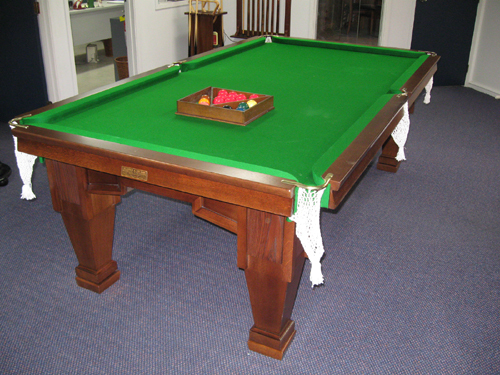 This beautifully restored billiard table features english pocketing, built in solid mahogany timber. The 1/2 inch one piece slate is covered with professional 6811 green pure wool cloth. 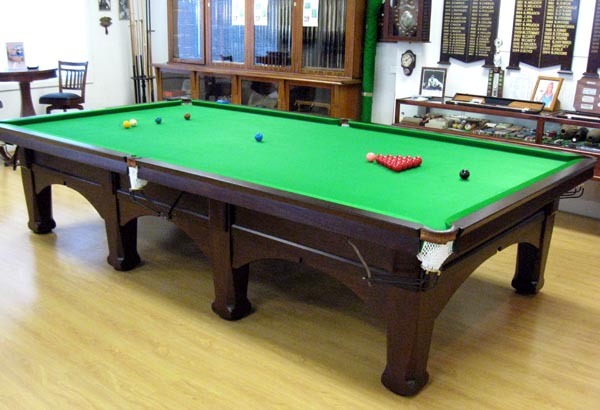 This table includes a set of pool balls, a set of snooker balls, two player scoreboard, four cues, triangle, cross Rest, cue rack, table Brush and chalk with chalk holders. You can purchase this table today for only.